A birthday celebration for Princess Genevieve has been scheduled the evening of December 10th at the Royal Palace. Prince Liam ordered invitations sent mid-November. Among the citizens of Azuria, well known guests expected to attend include, Princesses Coral and Violetta, Pirate Clara, the Good Witch Gwyndelyn, Sugar Plum Fairy, and the mysterious Snow Queen. Away at Azuria University, it is uncertain whether Princess Angelica, Genevieve’s younger sister, will be able to attend. Azurians love to dress up and the sparklier the better. 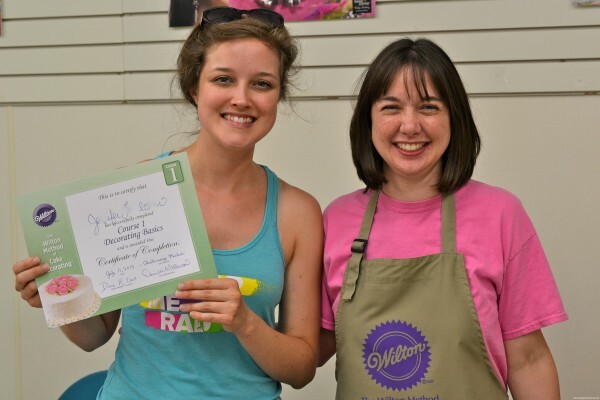 The dress shops are bustling with special orders and dressmakers are running extra low on sequins this week! The fairies have already been summoned multiple times today to create more sequins from Fairy Dust and snowflakes from Sapphire Mountain. We’ll post all the party details and even some free downloads this January so you can host your very own Crystal Ball! 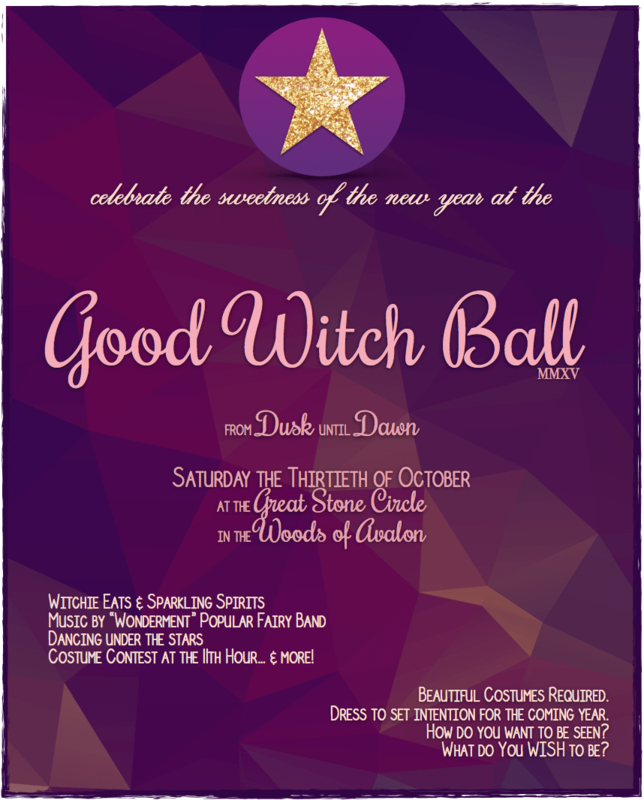 We had so many awesome comments about the Good Witch Ball and requests for the invitation! Thank you. So, we’ve decided to make it a free download for those Witchie Princesses at home. Now you can host your own Good Witch Ball in your own Stone Circle. Download the file and get ready for the Ball. We have it for both WORD and Apple’s Pages. 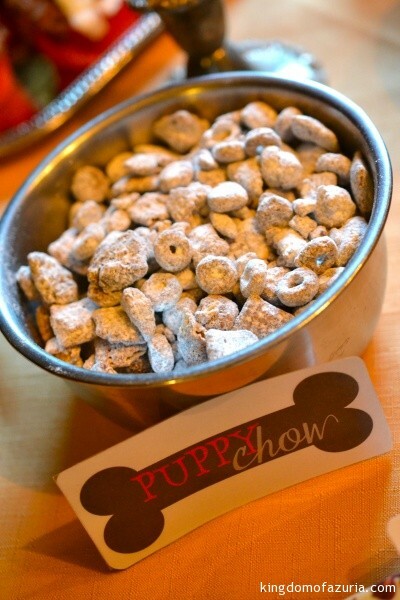 A continuation of our Puppy Party Ideas post from last week, which we think would also work just swell this weekend for the PUPPY BOWL parties we know you’re all planning. 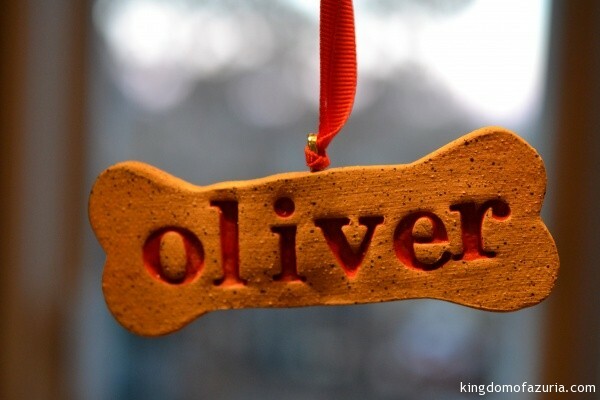 Oliver was lucky to have so many friends at his Birthday Paw-ty, so we had to make something to let them know how special they are! 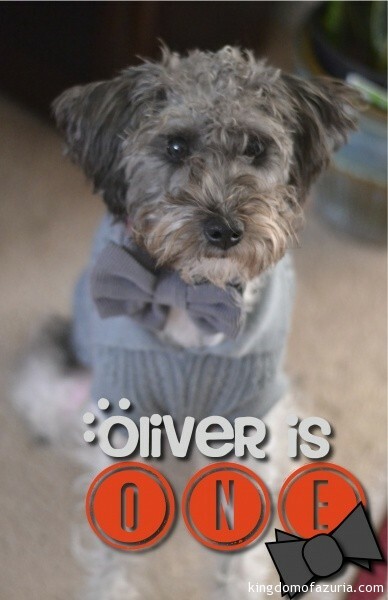 He has two signatures one is making the “O” in his name into a pawprint, and the other is always wearing a dapper bowtie, so we included these on the invitations and favor tags. The invitations read “come, sit, stay”! Which we thought was wildly clever. We found little foldable bags from the wedding section at the Dollar store filled them with homemade dog treats and pasted on our own “Thanks for coming to my paw-ty” tags. Download both the free printable and editable here Oliver’s 1st Birthday Party Editables and Oliver’s 1st Birthday Party Tags. You may need to download fonts to make them look just right. 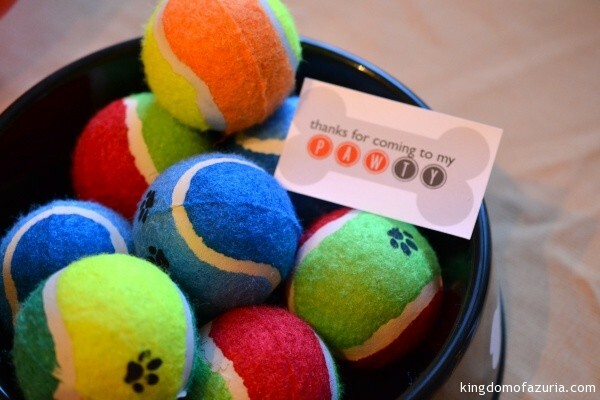 The other favor for all the canine guests was a colorful tennis ball with pawprints. They chose from the dog bowl. Both from the Dollar Store. We love any excuse for a party and this was one for the books! 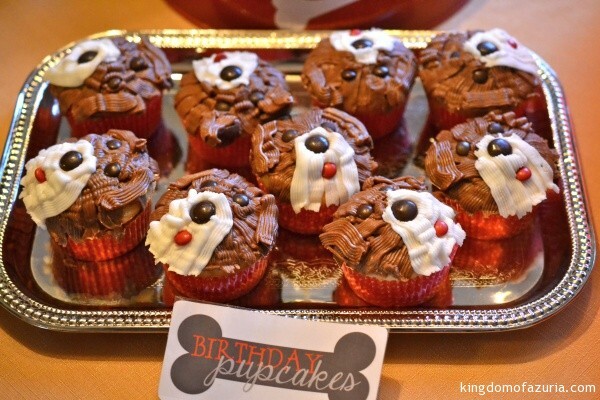 Puppy Party Food Ideas: Free Printables! Furry friends are just like family here in the castle. They bring us so much joy all year through. So that’s why when their special day comes around we have to make a big to-do! Our sweet puppy came into our lives last April and we have loved every minute with him. He is a joy. He is smart! He loves his Lamb Chops (which we had to get for him after puppy-sitting a neighbor’s dog in May. He stole the visiting pup’s toy until his mummy, Princess Genevieve, made him return it with an apology note). He adores people and other animals and like a true Royal wants to greet everyone when out and about. We are so blessed to have this fluffy baby in our world. 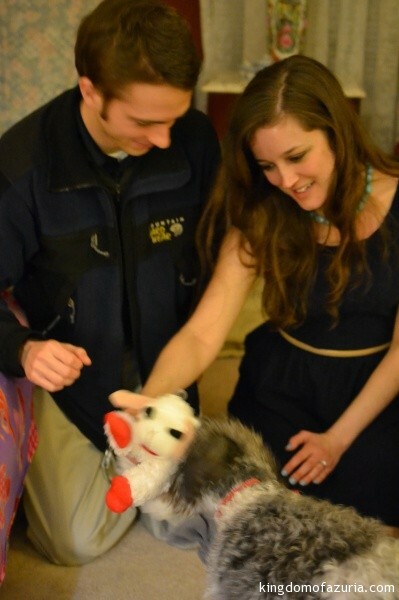 Here’s how we rang in his FIRST birthday with a special puppy paw-ty! 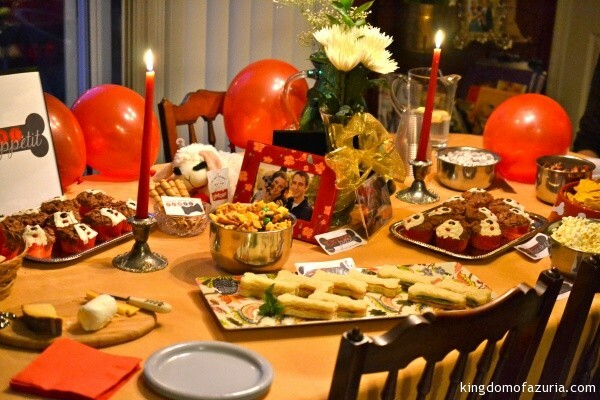 We used silver mixing bowls and dog bowls to display the appetizers (wait till you see the chip bowl) and decorated the table with photos of Oliver’s first year memories. Click and Oliver’s 1st Birthday Party Editables will open in a Powerpoint file. 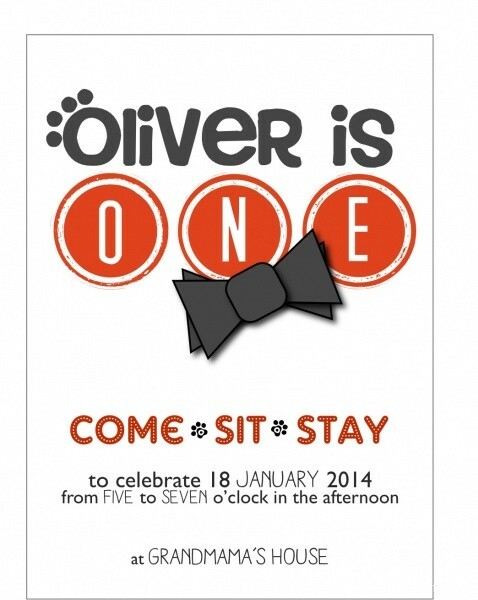 Oliver’s 1st Birthday Paw-ty Tag printable. You’ll need to download the fonts. 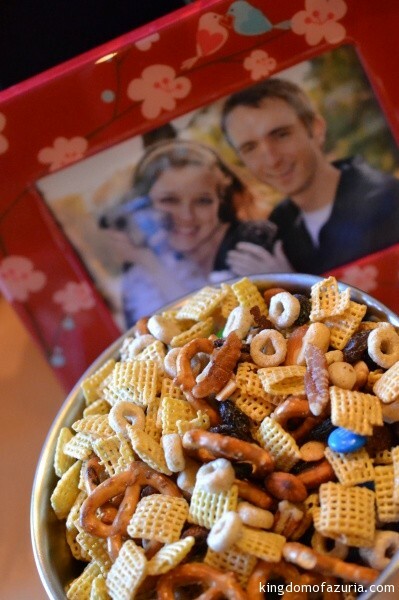 Puppy Chow Recipe – we added “O”s cereals – for “O”liver. 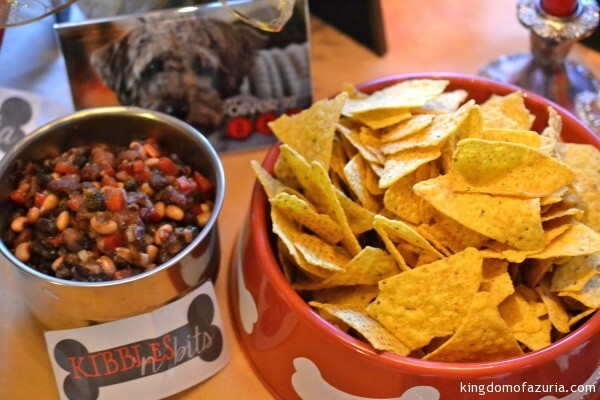 a Texas Caviar recipe (minus the green veggies, plus a dash of cumin) became “Kibbles ‘n Bits” and chips were served in a dog bowl from the Dollar Store! B”one”wiches! Ham, swiss cheese, and basil on country white bread. 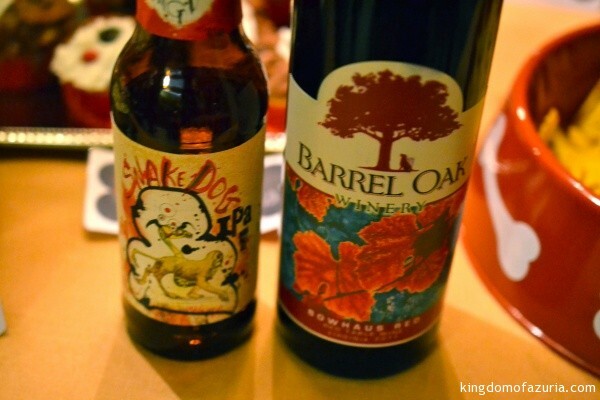 The adults partook in some doggie themed beverages. We served a special Sangria “Puptail”- instead of cocktails. By the way, the Bowhaus Red came from Barrel Oak – a winery in Fauquier County, Virginia. They love dogs, and if you noticed… their name spells, “BOW”! 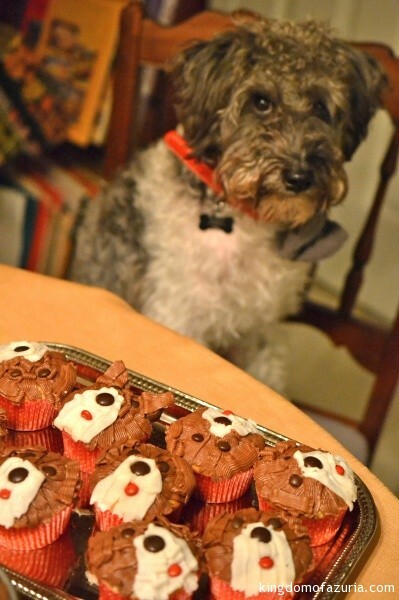 My favorite part: Oliver’s Birthday Schnoodle PUPcakes!! No dyes used – except for the M&Ms. I saw this idea on @jessandeddie’s instagram feed a few months ago and can’t wait to show them our version! 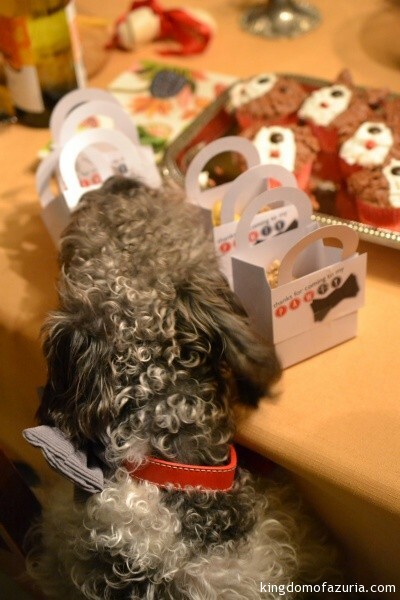 Check back for the Puppy Party Invitation and Favors post – coming soon! Hope you enjoyed our Puppy Paw-ty as much as we did! So, What Exactly is a Princess Party? 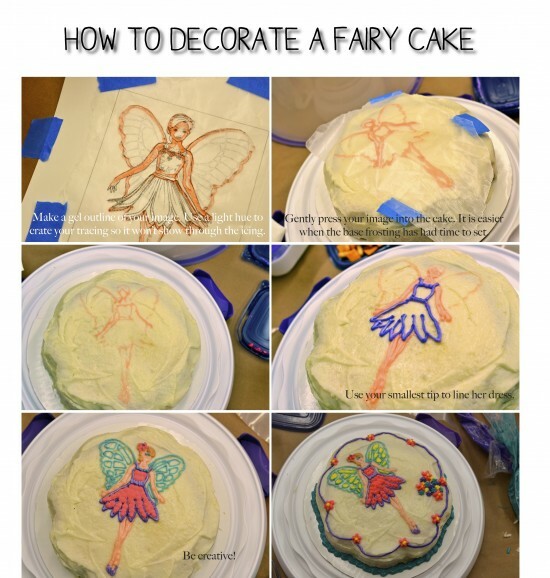 Its Whimsical Wednesday, so would you like to see what a princess party is like with the Kingdom of Azuria? Here’s some photos from a party Princess Angelica attended last November. Be sure to notice the looks on these sweet little faces as she enchants them with her tales of Azuria. At the end you’ll find a special testimonial from the Queen Mum. Special thanks to Queen Jen for sharing the photos.